The beauty of the Long Range Mountains of Western Brook Pond in Newfoundland, Canada from the water on one of the boat tours. The boat tours which explore Western Brook Pond in Newfoundland, Canada, take passengers on a spectacular journey amongst glacier carved cliffs and close to waterfalls cascading over the landscape from great heights above. The lake winds its way around the base of the rock cliffs for sixteen kilometers where the boat tours venture. The captain explains important geological and historical facts of Western Brook Pond while passengers take in the scenery. 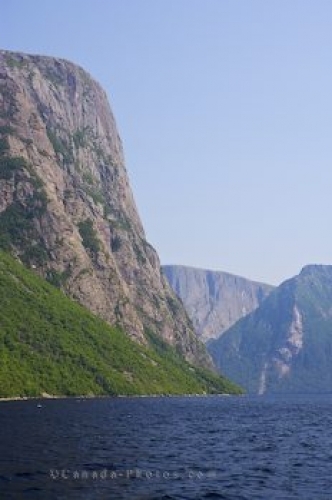 The Western Brook Pond boat tours allows people to see the majestic beauty of the area and the incredible scenery. Western Brook Pond seen from a tour boat, Gros Morne National Park, UNESCO World Heritage Site, Viking Trail, Trails to the Vikings, Highway 430, Northern Peninsula, Great Northern Peninsula, Newfoundland Labrador, Newfoundland, Canada. Picture of the scenery of Western Brook Pond in Newfoundland while on one of the boat tours.